In late 2014, in overdoing things with helping our older son with his tennis training, I developed a stubborn case of inflammation in my elbow. I tried everything I could to facilitate healing of inflamed tendons, but my foolish refusal to take an extended period of time off from supporting our son's training prevented my elbow from fully healing. My frustration led me to experiment with a number of natural extracts which I hoped would help accelerate recovery. I tried several combinations of dozens of compounds, and finally, I found a topical blend that changed the momentum of my elbow for the better. With this blend, I went from having pain and inflammation for several months to experiencing measurable relief and improved ability to strengthen the area within about a week of daily use. I shared this topical blend with our son's tennis coach to help him with a chronic wrist issue. Some of our son's tennis friends used it to address issues in the lower back and hips. And I had a number of others try this formula for recurrent pain, inflammation, and stiffness in other regions, including the ankles, knees, hands, and neck. In seeing how effective this blend is in facilitating recovery from chronic inflammation, I decided to produce a larger lot of it to share with our readers via our catalogue. But I share it with an important note, which is that this blend is meant to help those who cannot do the stretching, strengthening, and range of motion work needed to overcome chronic pain and stiffness and improve mobility. Ideally, this anti-inflammation cream is used to facilitate enough improvement with chronic issues to allow a person to adopt a regular practice of stretching, foam rolling, and mobility work. I worked with a professional lab to combine Arnica montana with MSM, essential oils - Frankincense, Peppermint, and Tea Tree - and several other natural compounds to ensure optimal penetration and effectiveness in facilitating movement of lymphatic fluids through a congested area. Water, Organic Aloe Vera, Wildcrafted Arnica Montana Organic Sunflower Oil, Palm Oil, Methylsulfonylmethane (MSM), Glyceryl Stearate, Cetyl Alcohol, Stearic Acid, Kosher Vegetable Glycerin, Organic Coconut Oil, Menthol, Frankincense Essential Oil, Peppermint Essential Oil, Camphor, Tea Tree Essential Oil, Shea Butter, Organic Jojoba Oil, Vitamin E, Vitamin B5, Phenoxyethanol, Ethylhexyl Glycerin, Green Tea, Citric Acid. The result is a moisturizing cream that is paraben-free and highly effective in facilitating recovery from chronic inflammation and associated pain and stiffness. 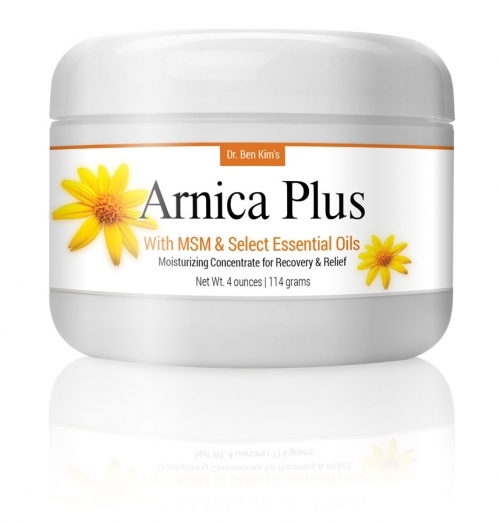 Each jar contains a net weight of 4 ounces (114 grams) of Arnica Plus. For optimal results, I suggest gently massaging Arnica Plus cream into your area of discomfort 3 times a day for up to two weeks, then on an as-needed basis. When the weather is warmer or if you prefer a thicker cream, our Arnica Plus inflammation cream can be kept in the refrigerator to firm up the blend, as the coconut oil within will make the cream thicker at lower temperatures. 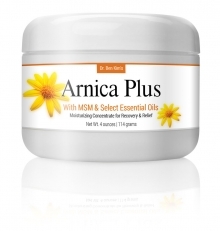 Please note that Arnica Plus is for external use only. Be sure to avoid contact with your eyes, and discontinue use if irritation occurs. Arnica Plus should not be applied to cuts. It's fine to apply to a bruised area, but it is best to avoid with burns or open wounds of any size. As with all topical creams, it's prudent to consult with your physician before using while pregnant or with children under 13 years of age. I crafted Arnica Plus for those who need a change of momentum with chronic pain and stiffness issues like osteoarthritis, as well as chronic injuries like tendinitis and tendinosis. When you improve enough to engage in stretching, foam rolling, strengthening, and general movement patterns to improve your mobility, please be sure to visit our YouTube Video library for ideas on how to design a self care program for your circumstances. Please note that Arnica Plus comes with a guarantee: If you don't feel that it helps in you a measurable way after trying it as per my suggestions and providing sufficient rest for the area in question, let me know and I'll see to it that you're given a full refund, minus shipping. I fully stand behind the quality and effectiveness of this topical inflammation cream. I swear by this cream. I keep it on hand for intense hip pain caused by fibromyalgia that comes and goes. I also use it when I have an episode of irritable bladder coming on and rub it over my abdomen (over bladder and top of pubis bone area). This has nipped things for me many times. I recently started a rash around my waist which was painful and itchy and have been using this cream for that (knock on wood it's been better). I love that frankincense oil is in this product as this is wonderful for inflammation and anxiety. Top notch product out there, thank you Dr. Kim! I'm a circus artist and get lots of bruises and over worked muscles. I love this Arnica cream it is by far the best I have ever found! I notice significant improvement only a couple hours after applying it. Thank you Dr. Kim for such a great product! I tell all of my circus friends about it. I love this stuff! I received a jar of Arnica Plus with an order and thought why not try it on my knee? Four and a half months ago, I fell and bruised the muscles above my knee on the right. Every since then my knee area works, but stays extremely tight. I followed the instructions and within only 1 1/2 weeks of the 2 wks the inflammation resided and there is absolutely no more tightness! It feels like I never fell at all! No kidding! And I have been telling everyone all about Arnica Plus ever since! Dr. Kim's arnica cream helped to heal a bursa on the bottom of my foot, along with lots of icing and a special removable pad. My foot doctor and chiropractor both approved my using the arnica cream. I used it twice daily, in the morning and evening before bed. The more diligent I was, the better it worked. I am very happy with my purchase. My husband has been using your arnica cream and it has helped him so much. He takes no other medicine for his chronic back pain. We love this cream it has helped him so much.